Thank you to Lenka Cathersides and Thomas Lyons for the following research. George Latter was born about 1893 in High Gate, Kent to general labourer John W. Latter and Rose A. Latter. George´s father John W. Latter was born about 1853 in Crowborough, Sussex. George´s mother Rose. A. Latter was born about 1854 in Uckfield, Sussex. George had a sister: Mary Ann Latter born in the 2nd quarter of 1885 in Uckfield, Sussex. At the time of the 1901 Census, the family lived at Spencer Road, Caterham, Surrey. John Latter was working as a general labourer and Rose Latter was looking after their children Mary Ann and George. George Latter married Amelia Charlotte Street in the 3rd quarter of 1912 in the Registration District of Croydon, Surrey. Amelia Charlotte Street was born in the 2nd quarter of 1889 in Shirley, Hampshire to whitesmith Joseph Street, born about 1845 in Andover, Hampshire, and Phoebe Street, born about 1860 in Southampton, Hampshire. 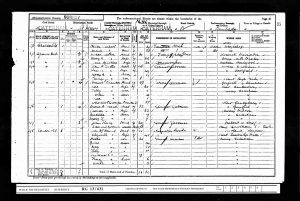 At the time of the 1901 Census, the family lived at 8 Crown Street, Shirley, South Stoneham, Hampshire. George and Amelia had a daughter: Gladys P. Latter born in the 3rd quarter of 1914 in the Registration District of Dorking, Surrey. Gladys married George R. Kent in the 1st quarter of 1943 in the Registration District of Christchurch, Hampshire. She died in 1963 in the Registation District of Portsmouth, Hampshire. George enlisted in Guildford into the Royal West Surrey Regiment. His regimental number was 4629. At the time of his enlistment he resided in Dorking. This altered in 1915 when the regiment merged along with the 1/24th battalion , 1/22nd and 1/21st to become part of the The 47th (2nd London) Division. This occurred on the 11th May 1915. The 2nd London was the second Territorial Force Division to arrive complete in France. He was a Lance Corporal and his new regimental number was 6927. George Latter was killed on the 2nd of October 1916 in France. He was shot through the head by a German sniper, and was killed instantly. He was buried the same night by a burying party. A comrade wrote: “How we miss him words cannot tell, Bravely fighting on the field he fell, He has done his bit, And he did it well“. 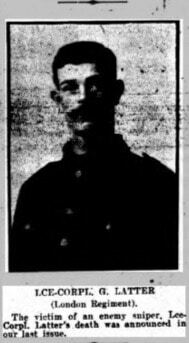 Lance Corporal Latter was formerly of Caterham Valley, and before the war he was employed at the Dorking Electric Light Works. In 1916, his wife, Amelia and their daughter lived at 3 Curtis Gardens, Dorking, Surrey. 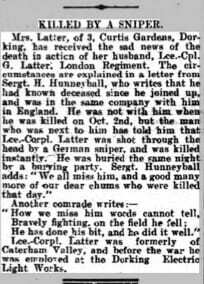 Lance Corporal Latter died within the time frame when the division was mounting numerous attacks on the Butte de Warlencourt . This lasted from 7th October – 16th November 1916 and was in the Somme sector. He is remembered on the Thiepval Memorial in France. Amelia remarried Arthur T. Polden in the 3rd quarter of 1918 in the Registration District of Christchurch, Hampshire. The couple lived at 39 Stanpit, Christchurch, Hampshire. She died in 1953 in the Registration District of Christchurch, Hampshire.